This stands for Several Times On Purpose and reminds them that this defines bullying. The Childline number is … 0800 1111 (sang with a wiggle!) This a Freephone number and can be used if you want to talk to anyone about anything which is worrying you. To always tell adult they trust if bullying happens. This adult could be someone in school or someone in your family. 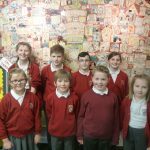 eCadets is a pupil led programme that teaches children how to stay safe online. Each term our eCadets are set challenges through which they learn new online skills and share their knowledge with the children in their class. We have chosen two eCadets from each Key Stage 2 class. They work with Miss Nelson once a week to complete their challenges and plan activities for their class. Every time you make a password use a mix of upper and lower case letters, numbers and symbols. Check with an adult that the website or video you are watching is suitable for your age range. Always check the information you read online. It’s not always true. Don’t talk to strangers online. Every time you sign up to a new website change your password. Tell an adult if you see anything online that you don’t like. Some personal information is best kept private. Not everyone needs to know where you live.